A DUP MP has asked UK Government ministers if they should "slap down" Tanaiste Simon Coveney, amid claims that comments by the Irish government were undermining unionist confidence. 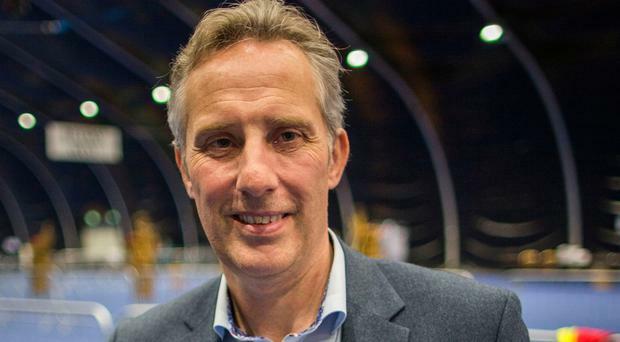 Ian Paisley pressed Northern Ireland minister Chloe Smith over an editorial in a Belfast newspaper that said comments by Mr Coveney were destabilising Northern Ireland's economy. Mr Coveney, who is also Irish foreign affairs minister, recently suggested that if Stormont couldn't be resurrected, other options - including an election, or "the triggering of Intergovernmental Conferences to make decisions on Northern Ireland" - could be considered. Unionists have interpreted the latter suggestion as a move to give Dublin a say in Northern Ireland's internal affairs. Northern Ireland questions in the Commons saw North Antrim MP Mr Paisley ask: "Does the minister of state agree with the editorial in the News Letter this week, Britain's oldest running newspaper, which stated categorically that Mr Coveney, the deputy prime minister of the Republic of Ireland, needs to be slapped down by Her Majesty's Government for the comments that it is making, that is destabilising the economy of Northern Ireland?" Ms Smith sidestepped the question, saying: "I think the simplest thing to say here is we stand behind, fully behind, the Belfast Agreement. "We do have a strong relationship with the Irish government, which we wish to see continue." Later, during Prime Minister's Questions, DUP Westminster leader Nigel Dodds asked Theresa May about "the well-established three-stranded approach to Northern Ireland which makes it clear that the internal arrangements and decisions on Northern Ireland are a matter for the United Kingdom Government and the parties in Northern Ireland?" Mrs May said: "I am very happy to make that clear to (Mr Dodds) and to confirm what he says, and we are very clear about the position and the decisions that will be taken about Northern Ireland. "What we do of course want to see is a Northern Ireland Executive restored so that we can see those devolved decisions being taken by that Northern Ireland Executive." Speaking later, Mr Dodds added: "There has been some loose, inaccurate and misrepresentative language used by a number of politicians from outside Northern Ireland in recent times. "Despite those comments however, the Prime Minister today was very clear that internal arrangements and decisions on Northern Ireland are a matter only for the United Kingdom government and the Northern Ireland parties." Elsewhere in the session, the government's approach to Brexit was branded "a shambles" by shadow Northern Ireland secretary Owen Smith, given its position over the Common Agricultural Policy (CAP). Northern Ireland Secretary James Brokenshire said the UK would be leaving the CAP in 2019, while maintaining payments through to 2020. Mr Smith said: "It cannot be right that we will both be under exactly the same EU rules and regulations, which is what the Prime Minister said in Florence, and that we will be leaving the Common Agricultural Policy. "If it is true that we are leaving the Common Agricultural Policy, 30,000 Ulster families and farmers need to know how they're going to pay their mortgages and meet their other commitments in just 15 months' time. This is a complete shambles. The Prime Minister is going to be here in a minute. Can he tell her to sort this out?" Mr Brokenshire replied: "The only shambles is the approach of the opposition to Brexit. "I know at this time of the year that many people will mark the 12 days of Christmas, but we've had at least 12 different approaches on Brexit from Labour. "I say to him that yes, we will be leaving the Common Agricultural Policy, as the Prime Minister said on Monday, but she also underlined clearly our commitment in relation to those direct payments."